SEK Genetics is open for business Monday – Friday, 8:00 am – 5:00 pm Central time. SEK is closed on the following state holidays: New Years, Memorial Day, Independence Day, Labor Day, Thanksgiving, and Christmas. For any questions or concerns about needing to return a product to SEK Genetics, please call us at 800-443-6389. Thank you. 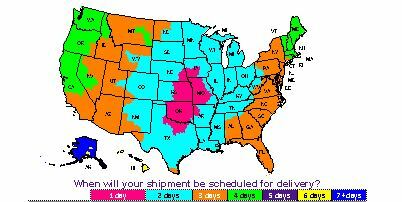 We ship throughout the United States. Note that there are restrictions on some products, and we do not ship outside of the United States. When you place an order, we will estimate shipping and delivery dates for you based on the availability of your items and the shipping options you choose. Depending on the shipping provider you choose, shipping date estimates may appear on the shipping quotes page. Days in transit starts on the first full day in shipment (the day after the order is placed), not the day ordered. Example: 2 days in transit- If it was shipped on Monday it delivered on Wednesday. SEK Genetics values our customers and respects your privacy at all times. We collect personally identifiable information about you during your check out process through our online shopping cart and payment gateway. We may also automatically receive general information that is contained in our server log files such as your IP address and cookie information. In an effort to improve your shopping experience and to communicate with you about our products, services, and promotions, we may use some information, such as your email address to contact you at a later date. We do not share your personal or financial information with 3rd party companies. You may request deletion of your email address from our files by contacting us.